Tanning travelled to France in July 1939 with letters of introduction to artists including Ernst, Chaim Soutine, Yves Tanguy and Pablo Picasso. She arrived in Paris in August and, with the country on the brink of war, found the city empty of the artists with whom she had hoped to be acquainted, and she returned to New York.6 She did, however, meet Ernst in December 1942 while he was selecting work for Exhibition by 31 Women, organised by Peggy Guggenheim, his then wife, at her Art of this Century Gallery in New York. Ernst visited Tanning’s Manhattan studio on the advice of gallerist Julien Levy and selected her painting Birthday 1942 for the exhibition, as well as suggesting the work’s title. Tanning went on to have her first solo show at Levy’s New York gallery in April 1944. While she and Ernst were building their house there in 1946–7, Tanning wrote ‘Chasm: A Weekend’, a short story that would eventually become the novel Abyss, first published in 1949 and then again in 1977 and 2004.9 Visitors to Tanning and Ernst in Sedona included artists and writers such as Duchamp, Roland Penrose, Lee Miller, Tanguy, Kay Sage and Dylan Thomas. 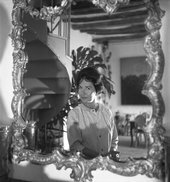 Following a move to France in 1949 the couple lived in Paris and then in Provence, but continued to visit their house in Sedona throughout the 1950s. Tanning and Ernst would live in France until the latter’s death in 1976, and in this productive period Tanning embarked on a range of artistic projects. Tanning’s first Paris exhibition, held at Galerie Furstenburg in 1954, was crucial in establishing her importance on the Parisian arts scene beyond her connection with Ernst. As she later reflected: ‘For me, an artist living in the shadow of a great man, it was somehow crucial.’10 Around 1955 Tanning’s paintings moved away from meticulously rendered figurative dreamscapes, increasingly employing confident gestural flow and movement as well as a more immersive use of figures and space.11 As Tanning recalled in her memoirs, ‘Gradually, in looking at how many ways paint can flow onto canvas, I began to long for letting it have more freedom’.12 This newfound interest in movement came in the wake of her work as a costume and stage designer for the ballets of the Russian choreographer George Blanchine – Night Shadow (1946), The Witch (1950) and Bayou (1952). When Ernst died in Paris on 1 April 1976, aged 84, Tanning was bereft. ‘There is no light in the studio,’ she wrote, ‘nothing moves and the colored jokes are fading fast. The disorder is grievous. (Is the heart condemned to break each day? )’14 In 1979 Tanning began her return to New York, which she completed in 1980. She published her memoir Birthday in 1986, and in 1994 established the Wallace Stevens Award for poetry, to be awarded annually by the American Academy of Poets. She created her last known paintings in 1998 but continued to write, publishing her expanded memoir Between Lives: An Artist and Her World in 2001. Her second collection of poetry, Coming to That: Poems, appeared in 2011. Tanning died in New York on 21 January 2012, aged 101. 1 Catriona McAra, A Surrealist Stratigraphy of Dorothea Tanning’s Chasm, Abingdon 2016, p.1. 2 Dorothea Tanning, Between Lives: An Artist and Her World, New York and London 2001, p.23. 4 Alfred H. Barr Jr (ed. ), Fantastic Art, Dada, Surrealism, exhibition catalogue, Museum of Modern Art, New York 1936, https://www.moma.org/documents/moma_catalogue_2823_300293441.pdf, accessed 28 February 2019. 5 Dorothea Tanning, Birthday, Santa Monica and San Francisco 1986, pp.73–4. Emphasis in the original. 11 Alyce Mahon, ‘Dorothea Tanning: Behind the Door, Another Invisible Door’, in Alyce Mahon (ed. 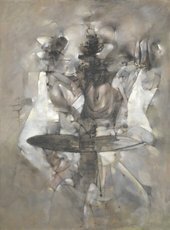 ), Dorothea Tanning, exhibition catalogue, Tate Modern, London 2018, p.29. 13 Tanning in Alyce Mahon, ‘Life is Something Else: Chambre 202, Hôtel du Pavot’, in Mahon 2018, p.65.